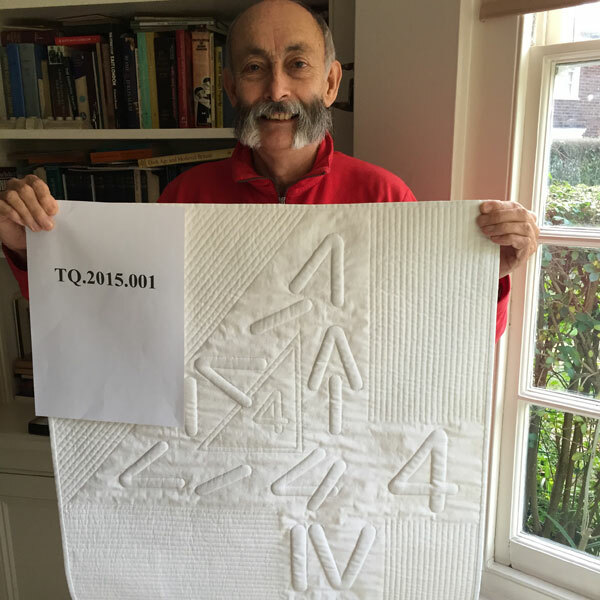 Philip likes a challenge, and his second quilt ‘IV-4’ won second place in a Quilters’ Guild competition. He explains how he made the quilt, where he gets his ideas, and how he researches techniques. Philip talks about how he came to make his first quilt, after spending time accompanying his wife, Jane, to quilt shows and supporting her role as a founder member of The Quilters’ Guild. Later he describes his need for technical precision in his work, his appreciation of Philippa Naylor’s work and his dislike of Sunbonnet Sue. Marlene Cohen [MC]: This is Marlene Cohen interviewing Philip Steward interview number TQ.2015.001. Philip, first of all thank you very much for coming along and agreeing to be interviewed. You’ve brought a beautiful white quilt with you. Would you like to tell us something about it? Philip Steward [PS]: Yes, the quilt is called ‘IV to 4’. Basically it’s Roman numerals in a ‘1’ and a ‘v’ going around in the shape of a number four and the way that the ‘1’ and the ‘v’ turn on the way round the shape then end up as a conventional figure ‘4’. Other than that it is a white, I suppose wholecloth really with the numbers are in trapunto just to make them stand out a bit with very, very simple straight line quilting because it’s a lot easier for me to do straight lines than it is to do anything else, basically. MC: Can you tell me something about your interest in quilting and how you began? MC: Was there anything difficult for you? I mean most women learn to sew at their mother’s feet. PS: No. I don’t think so because, when, as I was growing up I was in the Cubs and in the Scouts and in the Senior Scouts and in the Rover Scouts and one of the badges when you’re a Cub is the Sewing Badge so I actually got the Sewing Badge which, so it means I can actually darn a sock if need be, not that anybody does any more and sew on a button. I think I would find it difficult to put a zip in but the basics of sewing I can do providing it doesn’t become that difficult. As with machines I’m not too bad in straight lines but I need a lot more practice to get into free machine quilting. MC: It’s quite unusual for a man to be quilting. Do you have any feelings about that? PS: Um. No, not at all really. If I mention it to friends they just think that I’m slightly strange but not really, I mean there are male quilters and I know it is conventionally a female profession but then that’s because of the way history dictated it. But, it’s at the end of the day if you take it these days it’s only an art form. It just happens to be an art form with cloth, that’s all. MC: What do you get out of it? PS: There is satisfaction in seeing something when it’s actually finished. The only thing is that my, I think, my quilting experience isn’t necessarily the same as other people that need to sit down and they just want to make quilts and quilts and quilts. I am better off being challenged and that’s the quilt that we’re looking at today was a challenge piece because it’s just a way of actually getting me to do something because we all know that quilts in the long run are not a five minute occupation. That you have to sit and carry on and persevere and I’m extremely good at reverse stitching, or unpicking as people call it because I tend to be a perfectionist and the problem with perfection is that if you see the slightest little thing that’s wrong you take it apart. And when you take it apart it all takes time and sometimes you don’t actually have that time but you have to keep on persevering into the small hours of the night until the time you come to deliver the quilt and then you’re working until stupid hours because you said that it would be finished, and it does get finished in the end. MC: So you’re talking quite a bit about the challenge. PS: Yes, it is a challenge. 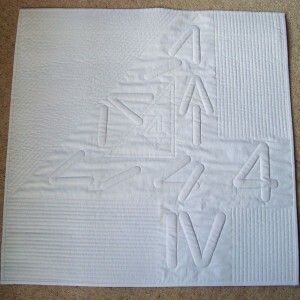 I mean this, the quilt that we’re looking at today, I’d never done any trapunto in my life but I just looked up a book, if I can say so it’s Philippa Naylor’s book and much to the disgust of my wife because my wife teaches quilting but it was a way of actually finding out and learning something. So I suppose that is a challenge but there’s plenty of books around to study. MC: Is there anything else you’d like to say about this piece? PS: If I can boast about it, it was made for the Sue Ridge World Challenge at The Quilters’ Guild AGM a few years ago and there were I think 21 quilts entered and that came second which I was quite pleased about it. MC: Philip could you tell us something about your general inspiration and influences? PS: Right, the influences as I said previously was the fact that I made these three small quilts for the tombola for the Festival of Quilts. Then that was it as far as I was concerned. 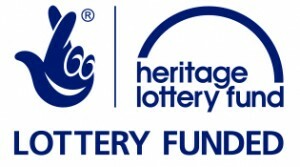 Unfortunately there was a challenge which was set down by Janice Gunner and Maggie Relph that they decided that they were going to get a group of friends and they were going to have a husband and wife challenge. Now being a man I thought that the idea of this challenge was basically the man thinks of the idea, the wife’s a quilter, she makes it but it didn’t work out that way. And I went up to Maggie Relph and I said ‘I’ve got this marvellous title for a quilt’ so she said ‘what is it?’ I said it was ‘Peggie Sue.’ So the reason it was called ‘Peggie Sue’ was that the actual challenge was that you had to have a piece of fabric that represented old wooden clothes pegs and it was an African fabric with three clothes pegs in dark red, light blue and a dark blue and then it repeated itself again and again and again right the way through the pattern and every quilt that was made in the challenge had to have a peg-related subject and as I hate Sunbonnet Sue because I think it is just pathetic I decided that I was going to make Sunbonnet Sues but take their heads off and replace them with peg shapes and that became ‘Peggy Sue’ and I made a tryptich quilt with Peggy Sues on it and at the bottom of each piece there was the line of Peggy Sue which I can’t remember, but it’s ‘Oh, oh, oh, Peggy Sue, why do I love you, you’re so blue’ or something, I can’t remember. And so that became the first quilt and then the second quilt was the four and subsequent to that I’ve made a couple more, but there’s nobody as such that really influences me in my style of work because I need a challenge, I can’t think of anything if it doesn’t work out while I’m in the bath then basically, I’ve done plenty of quilts in the bath, they’ve all been completely finished but they’ve never actually hung on the wall. Because the ideas are there from that, but there’s no actual people that influence me. There’s lots of work that I like. For absolute precision I like Philippa Naylor because I don’t think you can actually find a stitch that is anywhere wrong in any of her quilts. As for other people, we’ve got numerous quilts at home from other artists but I don’t think there is, I can’t see anybody that actually says what I should do or what my style is. Vicky Martin [VM]: The ID number is TQ.2015.001. This is a second interview with the initial interview was conducted in February between Philip Steward and Marlene Cohen. The second interview, the interviewer is Vicky Martin, the interviewee is Philip Steward and the interview is taking place at the Swiss Cottage Library in London. It’s the 22nd October 2015. Okay Philip, so can you just start off by telling me a little bit about the quilt you’ve got there? Philip Steward [PS]: Well, the quilt started off, it was a challenge at the 2011 Quilters’ Guild Conference at Exeter and it was called, the Challenge for the Sue Ridge World Trophy was called ‘Take Four’ so again, as in a previous interview it is, I thought of it in the bath and basically it is a wholecloth with trapunto and it starts off with the Roman numerals of a one and a V and these progress from the bottom of the quilt up to the top of the quilt, then they go down to halfway down on the left hand side and actually making a figure ‘4’ and the way they, as they make this figure ‘4’ the two Roman numerals change places until eventually they finish up on the right-hand side with the two figures, two the one and the V linked together, and that actually forms, loosely forms a figure ‘4’ as we know it today so, and the rest of it is just quilted in straight lines, just to accentuate the actual figure four that the trapunto pieces go into, and then in the very centre of the quilt there is also just a figure ‘4’, again in trapunto just to make it look nice more than anything. VM: Would you just, because people listening to this might not be able to see your quilt, could you just describe what it looks like colour-wise and size-wise? 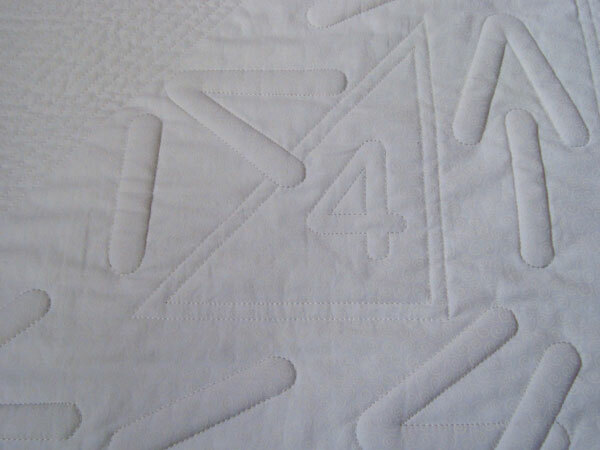 PS: Right colour-wise it is 2 foot square, it is completely white as a wholecloth quilt, there’s nothing else other than the figures that are actually made with the trapunto and just stitching to make the shape of ‘4’. The quilt, although it’s white has got a small squirly pattern on it just to give it a bit of pattern within the fabric. It’s bound again in white so it is a completely white wholecloth quilt. VM: And what is trapunto? 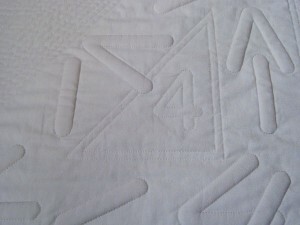 PS: Trapunto is a way of actually doing extra padding into something so that it looks more pronounced within the quilt so it produces a slight 3-D effect. There are different methods of doing it, some people actually have a, they make the object or the shape of the object that they want to stitch and then they actually slit the back of the quilt and then add extra quilt, extra padding into the back of it so that it looks pronounced but the way this was done was that the, initially I made the shape that I needed on the front of the quilt and then I actually got two extra layers of wadding and put these on the back of the front face of the quilt, sewed through with tacking stitches to form the, so that the wadding was then on the reverse side of the front of the quilt, trimmed it around the exact shape that I wanted and then when the quilt was laid with the backing, the actual layer of wadding and then the front of the quilt it meant that the, those figures then had the extra two layers in it and actually showed out more in relief on the front of the quilt. VM: So how much quilt making had you done when you came to do this one? PS: This was my second quilt that I’d ever made. The other one was my ‘Peggy Sue’ quilt and this again I’d no idea how to do trapunto so although my wife used to teach or still was at the time, a quilt teacher, I sadly looked in one of my favourite books, which was Philippa Naylor’s book and that’s how I learned to do trapunto because I just followed her instructions completely and fortunately when this was shown at The Quilters’ Guild AGM, I think there were about 24 other quilts which were in the Sue Ridgewell Challenge and this one came second. And I must admit the one that came first deserved to beat me, but even so I was quite surprised when I came second out of those quilts. VM: That must have felt like quite a buzz with it only being your second quilt. PS: It did because I was sitting at the front and I could see three quilts in a pile and I thought ‘oh, one of them’s got a white binding’ so I thought ‘I wonder whether that’s mine’ so I was quite surprised to find that it was and the one that won it actually had four seagulls on it and it was a lot nicer than this quilt but yeah, I was genuinely surprised that I could make something that people would choose and obviously it’s very simple but it was just, I think it just took the point. And it was take four and that’s all it is, it’s just a figure ‘4’ at the end of the day. VM: So is there a label on it? PS: Yes, there is a label and as always and it is called ‘IV-4’ which is IV and then a dash and just an ordinary 4 made by Philip Steward, London SE4 IJA, April 2011. The only sad thing about it is that whilst I was doing the quilting to get the straight lines I put some drafting tape on to follow so that I could follow that to make a straight line and I stupidly left it on the quilt for a couple of days because I was doing something else and when I took the masking tape off it left the glue on there and the glue you can still see and it is getting darker as the years go by and I’ve yet to find a way of taking it off without possibly ruining the quilt so sadly it’s just going to be left there as a mark of time! VM: You said that a lot of your ideas come to you in the bath. [PS Yes] What happens after you have the idea in the bath? With this one in particular. PS: Nothing. Basically. Because I have the idea and then, unless it’s for a particular challenge or something then… I’m not a prolific quilter so I only make things if there’s actually a challenge to do because there are other things, I’ve got other things that I could do in my life but it’s just one of those things. I belong to London Quilters and an exhibition this year or the end of last year into the beginning of this year. I was on the Committee for the quilt exhibition but I hadn’t even made a quilt and it was only within sort of the last probably few weeks that they said ‘well, where is your quilt?’ And I said ‘I haven’t made it’ and they said ‘you are going to make a quilt, aren’t you?’ So yes, I did make a quilt which was called ‘Just in Time Again’ because whenever I make quilts they always appear to be completed just in time, basically [laughs]. I don’t make anything that I can say ‘oh it’s a week to go and I’ve finished it completely and that’s it, I’ll wrap it up’, no it has to be within the last minutes of walking out the door basically. VM: How long did it take you to make this one? PS: Oh, I honestly can’t remember because I probably actually, probably took out more stitching than is in this quilt because again, although it’s all straight lines, if a straight line isn’t a straight line then it needs to be unpicked and put back until it’s straight. And because there are a lot of straight lines on this particular quilt there is probably quite a lot of working into the small hours and quite a lot of unstitching and trying to make sure that the holes weren’t showing where I’d taken the stitches out. VM: How do you? Because I mean do you keep this on display at home at all? PS: No, because I sadly, because it’s got the stain from the masking tape then I wouldn’t put it on display because I’m rather saddened by that one little error that’s there and people are only going to come up and say you know, ‘why have you got that stain on your quilt?’ And I suppose I’m fed up with saying it’s because of my stupidity really. VM: So where do you keep the quilts that you make? PS: The quilts, well, the quilts that we have at home that we’ve, that both my wife and I have made or the ones that we’ve bought from various quilt-makers are all basically stored on cardboard tubes that are wrapped in cotton. The quilt is then rolled onto the tube, it’s then had possibly another layer of wadding or a layer of cotton over the top of it to wrap it up. It’s then put into a purpose-made bubble wrap bag and then in turn the whole lot is then put into a purpose-made cotton bag to contain the quilt along with its own label so that we can find it when we need it and it’s then put into a large ottoman with all the rest of the quilts. There are a few quilts hanging up around the house which have been there, one of them’s been there for I don’t know how many years now, it’s just hanging up, but the others are alternated as and when we feel like taking them down and hanging it back up. But the one that’s been there for years is a Sandra Leech and it’s just at the top of the stairs and it’s not in the light, or not in bright light, it’s in subdued light so it just hangs there all the time as it’s rather nice and it matches the decor. VM: When you do make quilts are they all kind of small, for art, art hanging quilts or do you make any bed quilts? PS: No, no, they are all small. They tend to be, not, there is piecing in it but not piecing as in triangles or hexagons or whatever, small pieces. They tend to be much larger pieces of fabric and then sometimes it’s the fabric itself that allows it to make the pattern rather than sitting and joining lots of pieces together. My first ever quilt that I made which was for, which was an A4 quilt for the ‘Little Gems’ tombola was basically strips of black and pink fabric in different widths vertically starting off with a small pink fold and then getting into quarter inch, half inch, three quarter inch, I think the last one was an inch wide and just in a A4 size. And then my wife Jane said it needed something to brighten up so I put on seven beads, seven bugal beads and I then became so bored of sewing on beads I thought I’m never going to sew another bead on a quilt again and that’s how it was left. It was then nicknamed ‘The Tart’s Corset’ by Jane and went off to the Festival of Quilts to be in the tombola. And then I made, subsequently I made another two more quilts, two more A4 quilts for the tombola. One had organza in it so it was a little bit of difficulty in trying to work out, because again it had vertical strips of cotton and then organza and it was how you actually did the binding so that when you hung it it wouldn’t collapse because of the organza being weaker than the cotton. So I decided by putting a very, very thin piece of buckram in the binding that would then stop the whole thing distorting so that was just a little bit of a… being clever just for the sake of it I think. VM: Have you ever found out where any of those little quilts went? PS: Uh, no, sadly. If you look on the website of all those quilts, of all the makers, not many of them actually say where it was made, people possibly didn’t realise there was a website that you could look to see the majority of quilts that were made because when the quilts were made they all went to Hilary Guring and she photographed basically every quilt and put it on the website so you can see this a huge array of ‘Little Gem’ quilts, but although they’re all labelled no-one’s ever come back and said ‘oh, I’ve got one of your quilts’ or even with Jane made a few so no-one’s ever sort of said, you know, ‘got one of yours’. Fortunately we were lucky to, there was within the ‘Little Gems’ quilts they had some which were made by recognised makers and we were fortunate enough in the tombola to win one by Philippa Naylor so that is actually in a frame hanging up at home and she does know we’ve got it so, ‘cos we went and thanked her at the time at the show and said ‘ah, we’ve won your quilt, thank you very much’ and it’s in a frame hanging up on the wall. VM You mentioned Philippa Naylor a couple of times, are you quite a fan of her work? PS Ah, yes, because she is a quilter that’s, that if I ever could, that would be it, because the fact that the amount of the thousands and thousands of stitches that are in her quilts, I guarantee that you probably won’t find one that’s misplaced because she is that accurate and that’s what I love. It’s the accuracy. I’m afraid I’m one of these people that look at the quilt and what I want to see is the accuracy and I appreciate it’s easier to draw two lines or three lines or four lines converging to a point. When you draw it if it doesn’t work you rub it out but it’s very, very difficult when you’re actually doing it in fabric and I appreciate that some people can’t make those points come together and others do. And it’s the ones that do who are the ones that make me appreciate on the skill of their workmanship. Rather like good carpentry or any other fine craft when someone’s made it to the best that they can then it’s more appreciated. VM: So tell me a bit about how you ended up getting into quilting. PS: I ended up getting into quilting because my wife has always loved quilting. She was a founder member of The Guild. She then for years went to work because that’s the way it was, we couldn’t afford for her not to work so she didn’t do that much quilting. She’s always wanted to do City and Guilds and when it was at such stage whereby she could not work and we could survive at home as we were, she then went off to do this City and Guilds in Patchwork and Quilting but she would often come home and look at something with, she knew what she was doing but she would look at something which was a problem and she would often say to me ‘what do you think of this?’ and I would say ‘well, if you did this and if you did that, perhaps it may look like that, it may look a little bit better now if you take A and put it with B you may get D, not C’ or whatever, and so that became a bit of interest and then one day she was making a quilt and she… I think she does like, she does prefer hand stitching but, which she will, she does machine quilting but it’s like us all, it just needs a lot, a lot of practise and she hadn’t got the practise and she was making this quilt and it needed lots of curvy lines on it and I said to her ‘well, do you want me to have a go?’ and it was all quite large blocks, they were probably six inch blocks but each block had to be quilted separately with wavy lines so off I trotted and I did all the wavy lines, found it was reasonably simple to do the straight wavy lines so to speak and then left her with a load of ends to sew in because I hadn’t been taught that bit, so I just left her those ends [laughing] and she eventually taught me how to do ends. But yeah, I thought no I’ll do that bit and that’ll be it there. And then obviously once the other quilt that you’ve seen, the Peggy Sue then when Maggie Relph had this challenge Jane said ‘well, you ought to do it’ so I did and I’m not a prolific quilter, I just make something when I’m challenged to do it. But, I enjoy doing it. I can’t sort of sit down like a lot of people do and they’re, all their spare time they’re just cutting up fabric and joining it back together again, that’s not for me but I quite enjoy the process when I want to do it. We’ve both been doing a Committed to Cloth course with Clare Benn and Leslie Morgan. And this is a dyeing course, dyeing fabric and I enjoy dyeing fabric now and I’ve found that in my, in the last quilt that I made now ‘Just in Time’ was all my hand dyed fabric because I’d enjoyed the process of hand dyeing plain white cotton into all sorts of colours that come out of procion dyes which I really enjoyed. VM: So what’s it like being part of a quilting couple? Is there any competition in the house? PS: Um, the only, no, there’s no competition. I do it my way. Jane does it her way because she knows how to do it and if I have a problem I may ask her, perhaps I will ask her, but I might have looked in a book first of all just to see if it’s, if I can sort of get round it that way. It, there’s basically it’s either going to be in Philippa Naylor’s book for specialities or otherwise it’s going to be in Linda Seward’s bible basically because if it’s not in that book then it’s not written anywhere basically. That’s just the way, and then just trying things out and if things don’t work then there’s always the quick unpick because that’s a god saver to me. VM: So you mentioned this dyeing course that you’ve been on recently. Have you done any other workshops or courses at all? PS: I’ve only ever done two workshops, one was with Philippa Naylor again [laughs] sorry Philippa, you’ve got a mention and Sheena Norquay and they’re the only two workshops that I’ve done. I don’t really like workshops because workshops are something that you have to work at the speed you’re being taught basically and if I do something in a workshop and I don’t like it I actually want to unpick it and that’s not something in a workshop, you just get on because you’re trying to learn the process but I think that if it takes you four days to learn the process then it’s better than doing it once and not being allowed to unpick it because you haven’t got time and then you just sort of go away from it and think well yeah, that was ok, but I much prefer the slow, laborious looking in a book and doing it by process and by learning that way because it’s nice to have people teaching you but it’s not really for me I’m afraid, I’m not a good learner like that. VM: Had you done any sewing at all, before really? PS: I got my sewing badge while I was in the cubs. I learned how to darn a sock which people don’t do these days so I’ve always known how to sew so it wasn’t something that I’d never, never physically done and I’d often sort of played around on the sewing machine if there was one there that my mother had or something but it wasn’t something that I wanted to do, it’s just that I knew how to do it if necessary. I mean I’m not one for knowing every embroidery stitch there is but I have embroidered sort of tray cloth sort of things with, when my mother would bring one home with a pattern on it that was a transfer, especially with the transfers where you iron the transfer on to the fabric and then you had skeins of different silks so that I would do that as a bit of enjoyment but then that was while I was a boy. Then once you reach the teenager things take a different turn, basically. VM: Have you carried on doing any sort of like crafts or, after you were a child, doing any other sorts of things like woodwork, or? PS: I used to make plastic models, I used to airfix models. I was a great man for, great boy for airfix models, I would buy the next airfix kit for, I think they were two shillings or something, whatever it was and I had a great selection of paints and I would paint all of those. And then, after that I got a little bit more into doing Napoleonic soldiers which were only 54mm high. But this was sort of, I suppose, in my early teens when I would sit down and just paint the buttons one day on the tunic and decide that the next day that those buttons weren’t painted properly then I would over-paint them and then, or even take the paint away and then do it again and again and again and again until I’d got something that was right. I couldn’t just sort of make it and just paint it and say ‘oh, that was it’. Because if I wasn’t happy, there was a little bit of a line that wasn’t quite straight or something then I would do it again. Eventually I gave up doing those and just found other things that weren’t craft related that, basically taken over my sport because I love motor sport and I marshal regularly and that’s sort of taken over and that’s become my thing of life I suppose, really. VM: So you’ve always had a bit of a meticulous streak then? [PS: Sorry?] You’ve always had a bit of a meticulous streak? PS: Yeah, I am, I can’t. I can’t. Some people say ‘oh, it’s good enough’ when you do something and that’s not me, I think if it’s, if you know in your own mind then it wasn’t right then it’s not good enough. You’ve got to do it until you know that it doesn’t matter how many times you’ve done it you can’t improve on it and that’s me, that’s probably why I don’t do flying geese in circles or something because I know that at the end of the day I will just be cursing and swearing because instead of taking me three months it’s taken me three years because I’m just not happy with it. And that’s why I do more simplistic things I suppose you could say. But then some people say ‘well, you’ve got rows and rows of straight quilting all over the quilt, how did you manage to get them to be so straight?’ so some people just don’t want to do that because they just can’t sew straight lines, they veer off. But at the end of the day if you use the right tools they will veer off and you unpick them and you do them again. And then you do them again, and do them again until they’re right, so that’s it. VM: So which do you do? 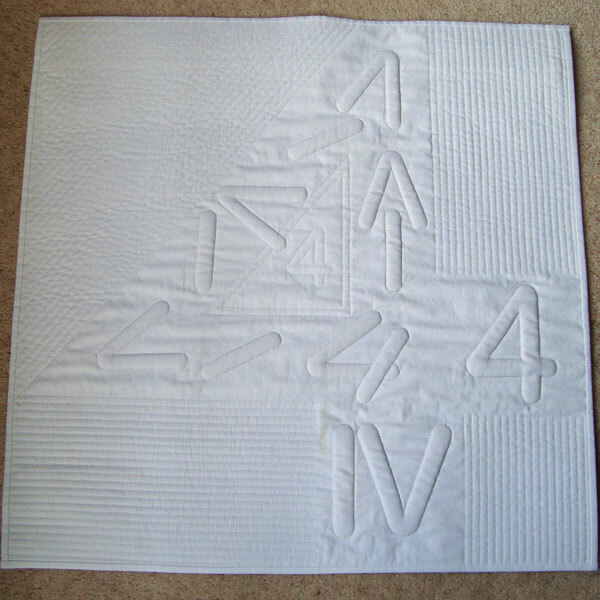 Hand quilting or…? PS: I can’t, hand quilting isn’t for me. I have tried it but I have rheumatoid arthritis in both wrists and you find, I don’t want, I see plenty of quilters that go round with their wrists strapped up because they just want to continue doing it but I’m afraid that it’s, when you‘ve got rheumatoid arthritis your bones are wearing out when they’re rubbing together and so to do something like hand quilting when someone invented a machine to do it for you then. Yeah I much prefer the machine quilting. Although I say that, the particular machine that I’ve got has got a tortoise button and a hare button and you go between and I’m very much the tortoise. If I then go and use my wife’s machine it will go too fast for me and it doesn’t matter how much control I try and do on the foot pedal it will always feed too fast so I go back to my machine which allows me to go as slow as I like even if the pedal’s flat on the floor. So that’s what I much prefer. VM: So you’ve got your own machine? PS: Yes. I have my own machine. But that’s more to, more because I couldn’t get on with my wife’s machine and why argue about who’s got the machine when if you’ve got two then you’re much better off. In fact I think we’ve got three at home. One’s just an older one. And we have a treadle machine as well but that’s not used, that was one of my cousins wanted to get rid of one and Jane said, we went to see them and he said, his wife said ‘you don’t know anybody who wants a treadle machine do you?’ so hence we now have a treadle machine. I don’t know what we are going to do with it. But it’s there. It probably won’t be used but, yeah. The sewing machine thing is that if you’re going to do something you really need your own machine because otherwise. You then know all the little bits, you don’t need to read the manual, you can just thread it like that and get on with it and then if I go to Jane’s machine and it’s threaded differently, the spool’s different, everything so then you have to sort of go through the learning process and it’s much easier to have your own machine really, although it may be sitting there unused for nine months of the year. You never know it may be surprised and think the polythene cover may come off and get used! VM: Where do you like to work in the house? PS: I normally work in the back bedroom, I just have a little table set up in the back bedroom and that’s it. Mainly because we have a study where Jane’s bit of machine is so it’s a matter of just finding another space to do it and the good thing is that in the back bedroom you can just do it, leave it out, you’ve got no need to tidy up everything that, you know some people do it in their dining room or whatever and then they have to put everything away when they’ve finished but the advantage is that you can leave it out, tidy it up, leave it for the next day, put the cover on the machine, next day just whip it off and then carry on quilting. VM: Do you tend to just choose what fabric’s already in the house with having a quilting wife or do you like to go out and buy them? PS: Right. This is a very much at a sore point because it tends to be that when I first started I would go and look at Jane’s fabric, mainly because we’ve probably got about ten full-size crates of fabric because ‘she who dies with the most stash wins’ so that’s the sort of motto. But I have got some of my own. But the problem with buying it, I tend to go and buy Heide Stoll-Weber fabric because I love the colours of it but of course then, it’s like with any expensive fabric you can’t use it because it means that you’ve got to cut it up so that’s always a problem so I’ve got a little bit of my own and now that I’m doing a dyeing course I can actually dye my own so that fabric is tended to be used because I can actually get something that I want, that I like, and I feel that it hasn’t cost me £26 a metre, it’s only cost me sort of £5 a metre which is a much more economical way of doing things but don’t get me wrong, Heide Stoll-Weber fabric is very nice but it’s expensive. VM: As is all fabric. PS: Yeah, yeah. I mean it’s horses for courses I suppose. You can get very cheap fabric and then when you start using it you realise why it’s cheap and you can get very expensive fabric which has got a lovely dense weave and it’s a joy to work with so yeah, it’s just one of those things with fabric, each to their own, what you can afford you use. People make quilts of old shirts so, that’s fine, if that’s what they want to do then it’s great. I mean they make memory quilts from their husband’s old shirts and things. As there aren’t many quilts, male quilters, I doubt whether they make quilts from their wives old dresses, but I mean it’s exactly the same thing, you know, memory quilts, children make memory quilts for different reasons which is great, really great. VM: What do you think people, what do you think your quilts that you make, do you think that there’s any of your personality that shows in the quilts you make? PS: [Pause] Um, no. I mean we talked earlier on about my ‘Peggy Sue’ and that’s mainly because I don’t like ‘Sunbonnet Sue’ because I just don’t like the idea. The only sunbonnet quilts I’ve seen are the alternative ‘Sunbonnet Sues’ where she’s tied to a railway line or found hanging from a tree which I think is quite enjoyable to look at! Just because it means other people don’t like it. But within personality, no I just think of an idea. Because I’ve made that many I just think of an idea and if I like the idea I just run with it because that’s the thing. I don’t think there’s any real personality. It may be in the fabric that I dye that there are just the sort of colours that I like. I like purples and magentas and yellows but I’m not a great, I’m not a great lover of greens unless they’re a very sort of vibrant lime green but I’m not sort of a dark green person or a dark blue. It needs to be a light blue or a light green, it needs to be turquoise or something that’s quite vibrant really. VM: Why did you chose this quilt to talk about? PS: Because at the time I only had two quilts and the reason I chose this one was that I’m, deep down, I’m probably quite proud that it was my second quilt, that it was entered into a competition and it came second out of whatever it was, the 24 and it was main, obviously it was mainly judged by women because that’s the vast membership of The Quilters’ Guild so it was something that, because it’s actually chosen on merit, there’s no labels on it to say who made it or anything at the time and it’s purely on merit and that’s why I like it. The other quilt, the Sunbonnet Sue quilt I liked and that was for a challenge but it was just a, it was a different form of challenge. This one was judged by my peers so as far as I was concerned it was, it merits more than the other one. VM: Sorry. So yes, you’ve got experience of seeing a lot of quilts, though. PS: Yes. I mean my wife doesn’t drive so I used to drive and, to the quilt shows and we’ve travelled hundreds and hundreds of miles to different quilt shows and if someone’s got a, having a particular quilt show that we know then we will drive hundreds of miles just to look at them. But the whole thing is that when I started going to quilt shows I would go round and look at the quilt and be quite critical of what I thought people should be doing and what they shouldn’t be doing but it wasn’t I wasn’t the poor husband who went round to carry the bags because the wife had been shopping if there was any stores at the quilt shows. I was the person that was going round and looking at things. And the one thing that we have got going for us is that although when I go round any exhibition I’m always two corridors, five paintings or whatever in front of Jane, I will take in what’s there and I often used to, well, I always did, we always took photographs of the quilts and we would walk round and I would look at a quilt and take a photograph of it, I would take if I wanted a particular detail of something I would take that detail, go round, carry on looking round, taking more photographs, more details, more photographs. Eventually I would then sort of go back to Jane and see how she was getting on and she would say ‘oh, have you taken a photograph of that one?’ ‘yes’ ‘have you taken a photograph of that one?’ ‘yeah, I’ve done that one’. ‘What about this one?’ ‘No I’ve done that one’ ‘can we have a detail of that one?’ ‘Yeah, I’ve done that one’ and the advantage that we have is that we actually both have the same tastes in quilts so that became the, when walking around it made it a lot easier because we’ve got the same tastes therefore we can go past things and say ‘well, I don’t really like that’ or whatever but it was good that I could actually take those photographs knowing that they were the ones that she wanted photographs of so that’s how it became. It became an interest in just looking at things like that and then when the Festival of Quilts moved to Birmingham and it got bigger and larger. And then we would sort of walk round in, we would walk round in one day and it was a quick walk to get around. 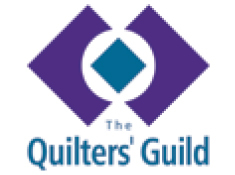 Then consequently when Jane became Co-ordinator for Region 1 of The Quilters’ Guild which is London and Middlesex it then meant that I was, again because she can’t drive, we had stuff to take to the Regional Days so I would take that so that became more interest. And then, because we had speakers would come so we knew more people we would then go to the Festival of Quilts and start to walk round and meet more people so therefore it got longer to actually walk round and we would see less. Subsequently she then became a Trustee of The Quilters’ Guild which then meant that she actually went for all the four days and I would drive up there on the Thursday, go all round the quilts on the Thursday, look round, drive back home, look after the cats. Then on Sunday go back up there for first thing, look round all the quilts again, so I consequently had two days there, and she had four days there. But over the years it’s now got to the stage where possibly on the first day we don’t actually look at the quilts until well after lunch time because we’ve actually been talking to people which is the process of quilting, that you meet more and more people who at these shows and you just stop to have a chat. And it’s quite a marvellous, marvellous world in its own. Providing you stop and talk to these people then they become friends basically and it’s a great world.